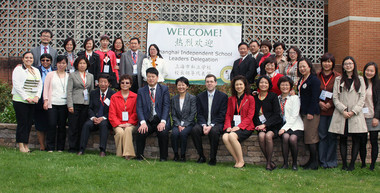 Twenty-one elementary school principals and university professors from Shanghai, China, visit Bilingual Buds Immersion School in Summit recently. SUMMIT — “I could not have imagined a more exciting day in our eight-year history,” said Bilingual Buds founder Sharon Huang to 21 elementary school principals and university professors from Shanghai, China. The delegation of educators came to the United States to gain insight about current trends in American independent schools, including best practices and innovative teaching models. The group’s two-week visit, hosted by the Asia Society, was led by Professor Zhang Junhua, deputy director of the National Center for Principal Training and Development of the Ministry of Education at East China Normal University.